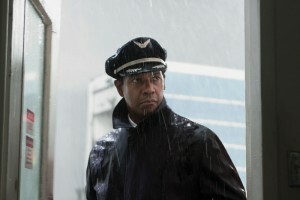 In Robert Zemeckis’ first live action film since 2000, “Flight,” Denzel Washington plays a pilot who saves 96 people when his plane begins to fail. Despite the misleading action-packed trailer, the film follows the story of Washington’s character and his battle with addiction. The film opens on captain William “Whip” Whitaker (Denzel Washington), the coolest pilot on the block, the James Dean of the skies. Before a flight, he spends the night with a beautiful stewardess, drinks, smokes and does cocaine. His confidence is exhibited by a slow-motion sequence of him strolling down a hotel hallway, sunglasses perched on his face. After takeoff, he seems reckless as he flies the plane upward through heavy storm clouds at alarming speeds. As the plane descends, something goes terribly wrong and it starts to drop. Being a Navy-trained pilot, Whitaker snaps into action while his co-pilot dissolves into a panicky mess. As a result, he is forced to control both fear and plane at the same time, a scene that had me on the edge of my seat. To control the rapid descent, he turns the plane upside down and crashes in a field, an event that kills four people and saves 96. Although an instant hero in the eyes of the public, Whitaker is soon under the microscope of the National Transportation Safety Board as it conducts an investigation into the cause of the crash. From here, the film becomes a character study and relies on the strong performances of its lead actors. Despite the film’s name, the movie is mainly about addiction, something that was not made clear in the trailers. Whitaker realizes that he could be charged with manslaughter and life in prison. Rather than sharing his feelings, he drinks them away, inflicting damage on himself and those closest to him. He resembles Eddie Valiant, the alcoholic detective of Zemeckis’ 1988 film “Who Framed Roger Rabbit.” In essence, Whitaker is an antihero. As if we didn’t need another reason to admire Washington, he delivers this role with unflinching truth. Other notable performances come from the likes of John Goodman, the comedic relief (Goodman plays a similar type of role in October’s “Argo”) who plays Harlan Mays, Whitaker’s hippie-esque friend and drug dealer. Don Cheadle plays Hugh Lang, Whip’s no-nonsense lawyer who is committed to one personal truism: his clients don’t go to jail (even if it means lying about the days leading up to the crash). The film also explores the themes of God and preordination. While recovering in the hospital, Whip sneaks into a stairwell to smoke. There he meets Nicole (Kelly Reilly, the romantic interest), a recovering heroin addict. “Once you realize that God is in control of everything, you’ll live a much happier life,” Nicole says. In addition, Whitaker’s religious co-pilot (Brian Geraghty), who, while busted up beyond repair, concedes that it was God’s plan for that accident to occur (“Praise Jesus!” his creepy wife declares). When referring to Whitaker’s landing, Lang calls it “an act of God.” “Whose god would do this?” Whitaker ponders. Music adds a vibe of slickness to the movie, particularly “Gimme Shelter” and “Sympathy for the Devil” by the Rolling Stones. Both relate to the events of the film, as Whitaker attempts to seek shelter from the news crews and his self-destructive behaviors. Nevertheless, as he stumbles about, it’s hard not to feel bad for him. Like many of Zemeckis’ films, however, “Flight” centers around a single character who is thrust into a situation for which they are not prepared. Just look at Marty McFly in “Back To The Future” or Chuck Noland in “Cast Away.” Instead of giving up, these characters strive for survival and happiness by any means necessary. While “Flight” does stumble at points, much like its central character, it soars when it finally gets off the ground.